Validation of PLZF antibody in ChIP by PLZF kncokdown. After induction of differentiation, the hMSCs cells undergo a hyperproliferative phase within the first 2 days followed by growth arrest and differentiation. The dynamics of this transition can be revealed by: (A) Western blot for retinoblastoma2 (pRB2, also known as p130) and Cyclin E. Cyclin E is expressed in naïve proliferating (day0) and hyperproliferating (day2) hMSCs and pRB2 (p130) is abundant and hyper-phosphorylated (marked by*) when cyclin E is present (Howard et al., 2000). pRB2 becomes hypo-phosphorylated and reduced in amounts when cyclin E is downregulated and cells cease to proliferate and start to differentiate. The antibodies used for Western blotting are pRB2 (Santa Cruz, SC317) CyclinE (mab, HE12). (B) Microarray analyses done in three biological replicates in hMSCs at the indicated time points using Affymetrix gene chips (HT_HG-U133_Plus_PM). The data were analyzed by ‘array tools’ and represented as heatmaps. In the right hand side, the Pie chart represents the enrichment of key words from genes that were significantly induced (1.5 fold) following induction of osteogenic differentiation at day 2 (n = 537), day 5 (n = 590) or day 10 (n = 641) or reduced at day 10 (n = 578) compared to naïve hMSCs analysed by DAVID (Huang et al., 2009). The global gene expression profile showed genes related to ‘induction of cell proliferation’ as well as ‘skeletal system development’ at day 2. The ‘proliferation associated genes’ were downregulated at day 10. ‘Skeletal system developmental genes’ continued to increase in expression at later time points (day 5 and 10). (C) Alizarin red staining in naive or late time points of osteogenic differentiation (15 days and 21 days) shows strong red staining representing calcium precipitates after 21 days. The pictures were taken using Leica camera (EC3) attached to an inverted microscope at 20X. A scale bar (100 µm) is shown in the picture. Together, these results confirmed that the earliest time point (day 2) represents a hyper-proliferative, but committed state (pre-osteoblasts), whereas day 10 reflects the immature-osteoblasts stage). Mineralization and osteoblasts maturation starts to take place after 15 days of differentiation. 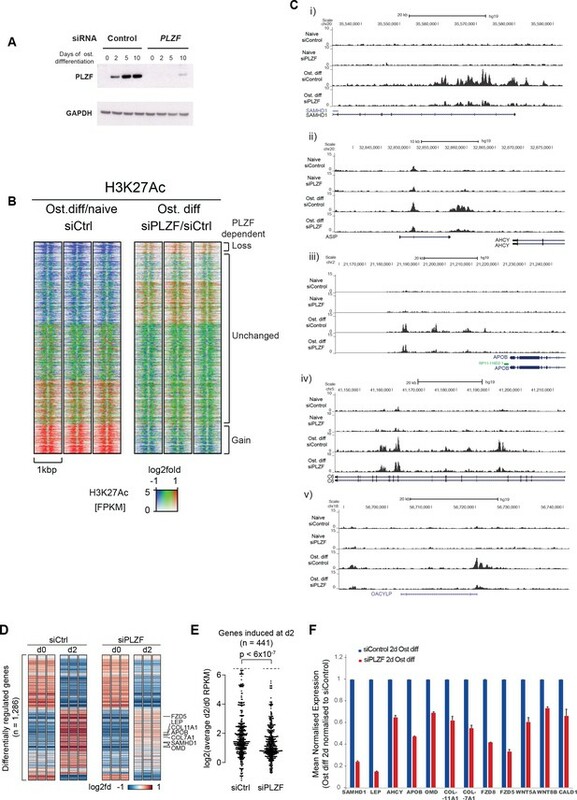 (D) Pseudo-colored 2D histogram showing the H3K27me3 ChIP-seq signal quantified at gene transcripts from start to end ± 1 Kb (n = 44,451) in naive hMSCs (day 0) (Y-axis) and at day 10 of osteogenic differentiation (X-axis) in relation to changes in H3K4me3 levels. H3K27me3-positive genomic regions (n = 44,451) are pseudo-colored according to the average log2 fold changes in H3K4me3 (day10/naive hMSC) upon osteogenic differentiation. Regions that gain H3K4me3 are colored red, and regions with loss in H3K4me3 are colored blue. A bar showing the relationship between coloring and H3K4me3 changes can be seen at the side of the plot. 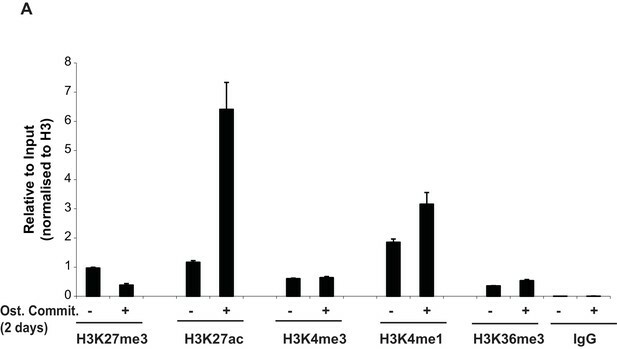 (E) and (F) Average distribution of H3K4me3 and H3K27ac histone marks at TSS ± 2.5 kb of transcripts that loose (red colored regions in S1E) or gain (blue colored regions in S1E) the H3K27me3 mark during 10 days of osteogenic differentiation (immature-osteoblasts stage). (G and H) Scatter plot of the observed (Obs) to/expected (Exp) ratio indicating the positive correlation between H3K4me3 and gene expression and a negative correlation between H3K27me3 and gene expression (highlighted in red) during osteogenic differentiation.I) GO term analyses of transcripts that lost H3K27me3 and gained H3K4me3 and were induced in expression using DAVID (The Database for Annotation, Visualization and Integrated Discovery, n = 5179). 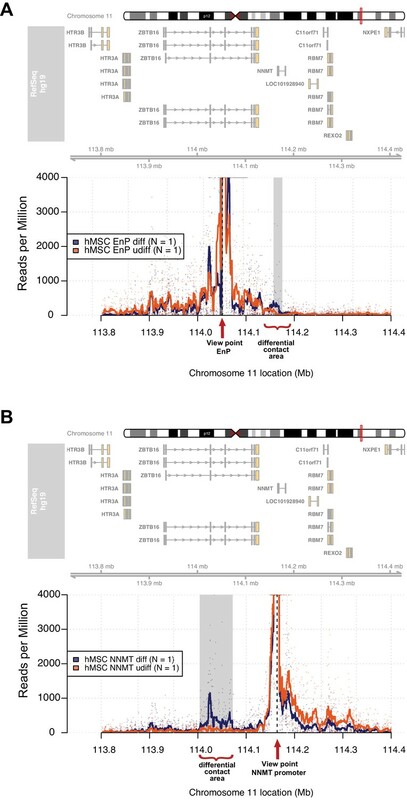 The Y-axis represents the –logP value (with Benjamini correction cut off < 0.05) (J) Genome browser tracks representing ChIP-seq tracks from naive and immature-osteoblasts (10 days of osteogenic differentiation) at gene loci where loss in H3K27me3 and gain in H3K4me3 and H3K27ac at TSS are shown. BMP, Bone Morphogenetic Protein; Lep, Leptin. 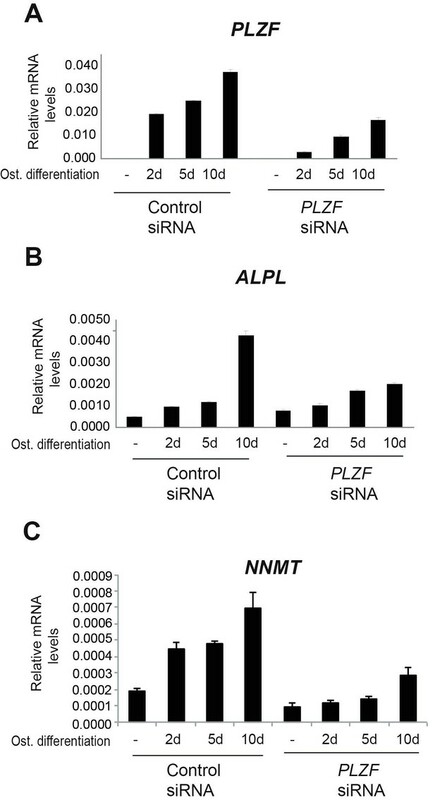 (A) The table shows the mean normalized expression (NE) values for indicated TF and markers obtained from RNA-seq during osteogenic differentiation of hMSCs based on three biological replicates. (B) On the right hand side, the mean normalized expression values ± SD are plotted and represented as graphs for selected genes. 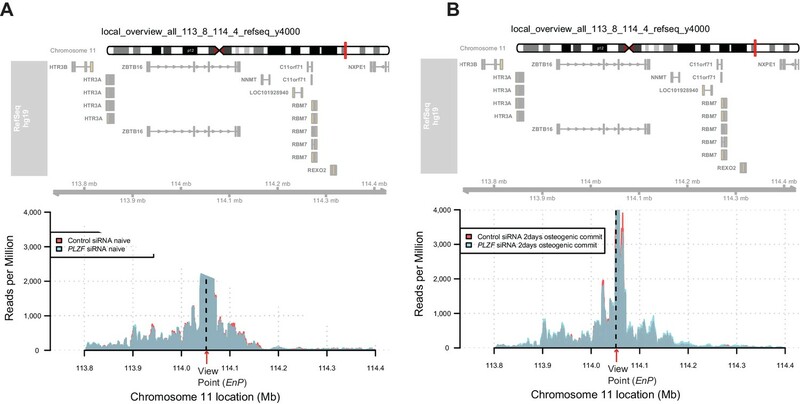 (C) Genome browser tracks showing histone marks obtained from ChIP-seq and expression from RNA-seq for selected gene loci in niave hMSCs and after induction of osteogenic differentiation at the indicated time points. RUNX2, Runt related transcription factor-2; ZBTB16, Zinc finger and BTB domain containing 16; FOXO1, Forkhead box O1; SP7, Transcription factor 7/Osterix. (A) Top motifs and output from discriminative de novo motif analysis of d10 PLZF peaks and random negative control regions matched to the peaks in terms of TSS distance and orientation. The most significantly enriched motif from two different algorithms are shown. (B) Profile of the average motif enrichment across PLZF peaks. Both output from MEME and DREME are centrally enriched at the PLZF peaks. 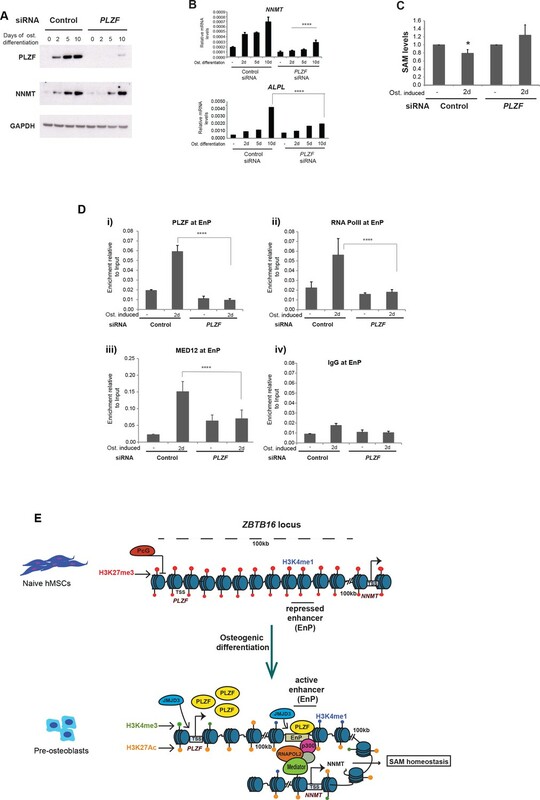 (C) Validation of specificity of the PLZF antibody in ChIP was performed by siRNA mediated PLZF knockdown followed by osteogenic induction for 2 days. (C) The ChIP-QPCR data is shown in the plot at the EnP element. Data shows mean ± SD from triplicates of QPCR from three biological replicates (p < 0.05, two tailed t-test). 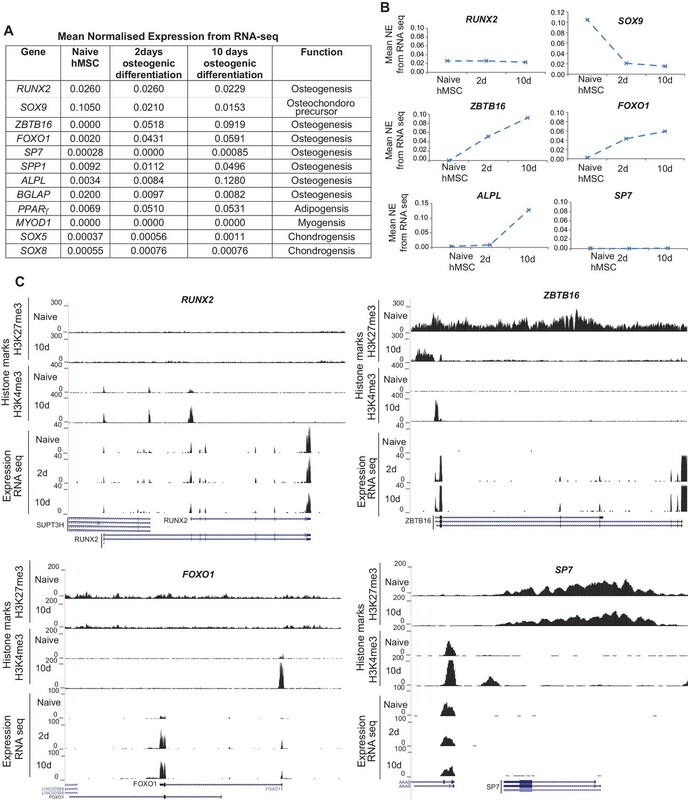 DPLZF bound genomic region proximal to Col1A1 gene. Data shows mean ± SD from triplicates of QPCR. 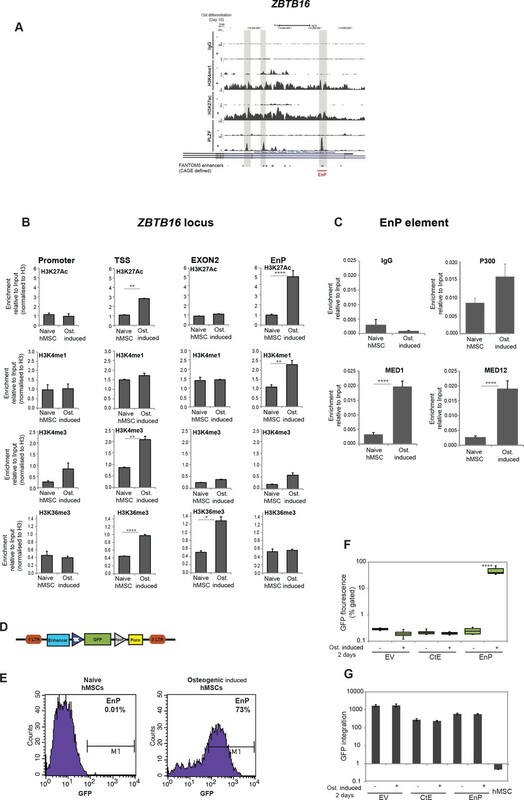 (E) PLZF bound genomic region proximal to SMAD3 gene. Data shows mean ± SD from triplicates of QPCR. 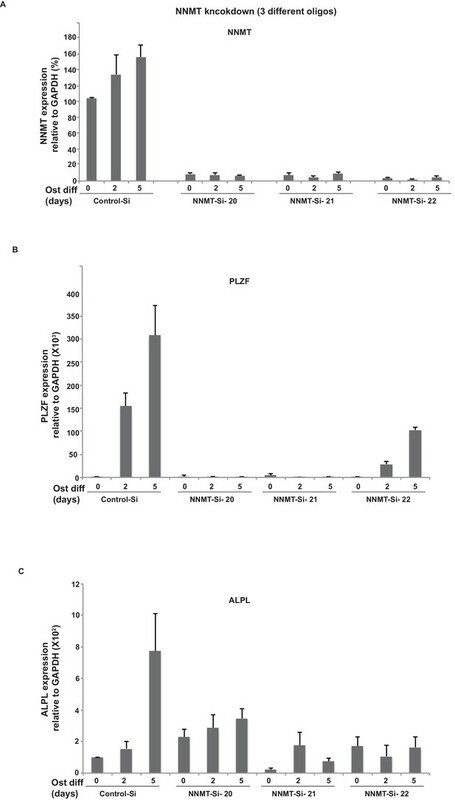 (A) Average tag distribution plots show co-occurrence of PLZF with Polycomb (SUZ12, RING1B) or H3K27me3 in hMSCs before and after osteogenic differentiation for 10 days (immature-osteoblasts) centered at PLZF peak ± 5 kb. (B) ChIP-seq tracks representing genomic region that gained H3K4me1, H3K27ac and PLZF binding in immature osteoblasts (highlighted in grey box). The overlap with FANTOM5 enhancers are indicated at the bottom of the tracks. (C) Gene ontology analyses using Enrichr (Chen et al., 2013) showing MGI_mammalian phenotype significantly enriched in our data sets of PLZF bound genomic regions that gained H3K27ac and showed increased expression of nearest transcript. 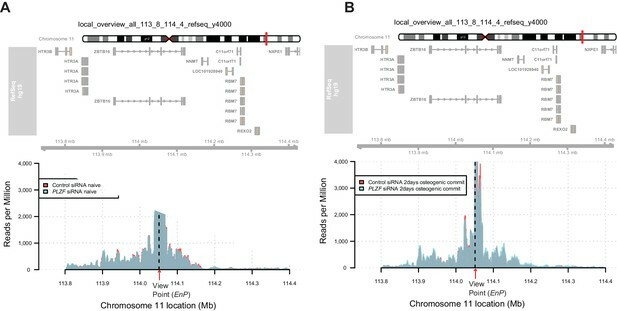 Mean normalised expression of selected transcripts from RNA seq analyses. 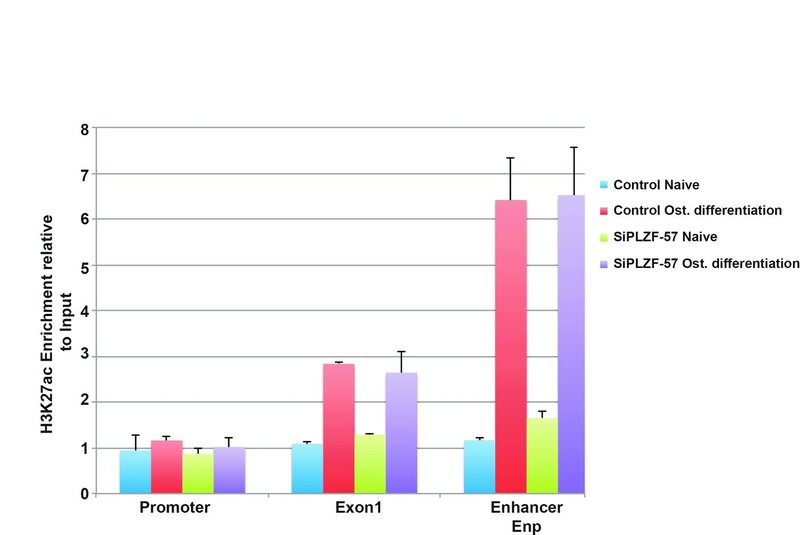 (A) PLZF knockdown using three different siRNA (55, 56, 57) in hMSCs measured by RT-QPCR. hMSCs were transfected with siRNA oligos against PLZF or scrambled control oligo as indicated. After 24 hr the medium was changed and osteogenic differentiation was induced for 2 days. Relative mRNA levels were calculated after normalization to GAPDH. Data is mean ± SD from triplicates of QPCR experiment. The siRNA oligos were ordered from Sigma mission and oligo IDs are given in Supplementary file 9. 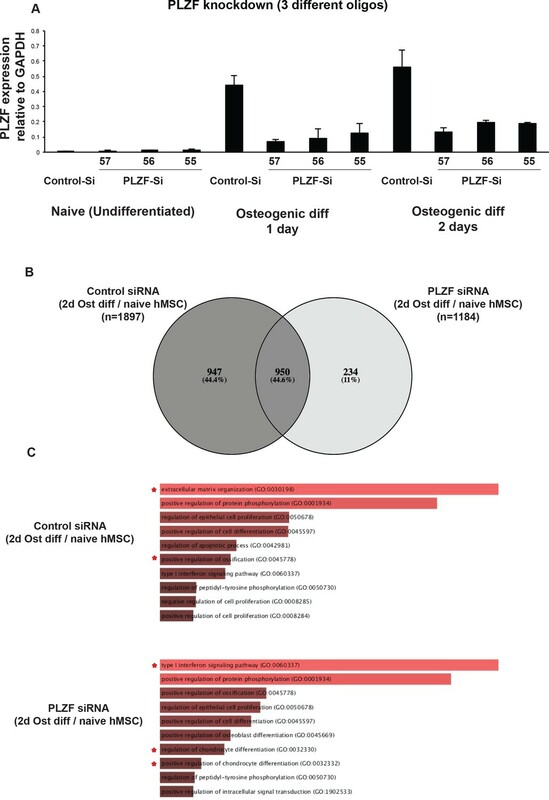 (B) The Venn diagram shows the overlap between differentially regulated genes upon induction of osteogenic differentiation from RNA seq analyses in hMSCs, in the presence or absence of PLZF. The diagram was generated using online tool Venny (Oliveros). 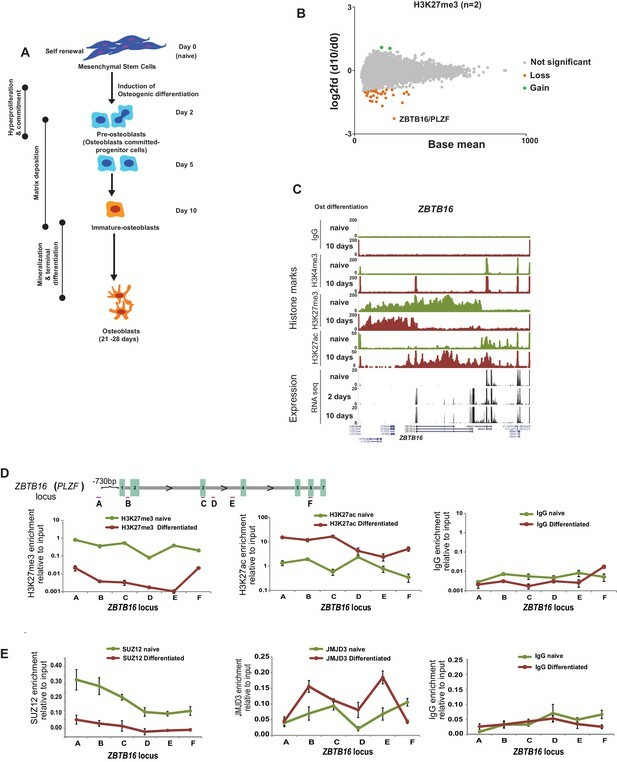 (C) The bar graphs show the Gene Ontology (GO, Biological processes) terms enriched for differentially regulated genes from each group; control siRNA or PLZF siRNA transfected hMSCs upon induction of osteogenic differentiation (2d vs naive). The online tool Enrichr was used for the analyses (Chen et al., 2013; Kuleshov et al., 2016). The values in the graph are combined scores computed by multiplying the p-value (Fischer exact test) with z-score of the deviation from the expected rank. ChIP for Med1, Med12 and P300 in hMSCs. (A) ChIP-QPCR at another PLZF peak observed within the ZBTB16 locus showing enrichment of histone marks (H3K27ac, H3K4me1, H3K4me3 and H3K36me3) in naive hMSCs or in pre-osteoblasts (at day 2 of osteogenic differentiation). QPCR data is shown as mean values ± SD of triplicates from three biological replicates. Region amplified by QPCR corresponds to the primer D shown in Figure 1D. General IgG was used as negative control. Long range interaction map using control regions as view point revealed by 4C-Seq in hMSCs before (naive) and after induction of osteogenic differentiation (day 2). The plot represents the overlay between naive and day 2 of osteogenic differentiation. Data are displayed as reads per million (RPM). (A) NNMT promoter upstream region as a control viewpoint, (B) The ZBTB16 promoter as viewpoint. (A) NNMT knockdown using three different siRNA oligos (20, 21, 22) in naïve and osteogenic differentiated (2 and 5 days) hMSCs, assessed by Q-RTPCR. Experiments shown are mean ± SD from triplicates of Q-PCR experiment. The siRNA oligos were ordered from sigma mission and oligo IDs are given in supplementary file 9. (B) Expression of PLZF/ZBTB16 and C) ALPL, after NNMT knockdown (three siRNA's) analyzed by Q-RTPCR. Experiments shown are mean ± SD from triplicates of Q-PCR experiments. ChIP for enhancer binding proteins in hMSCs, in the absence of PLZF. 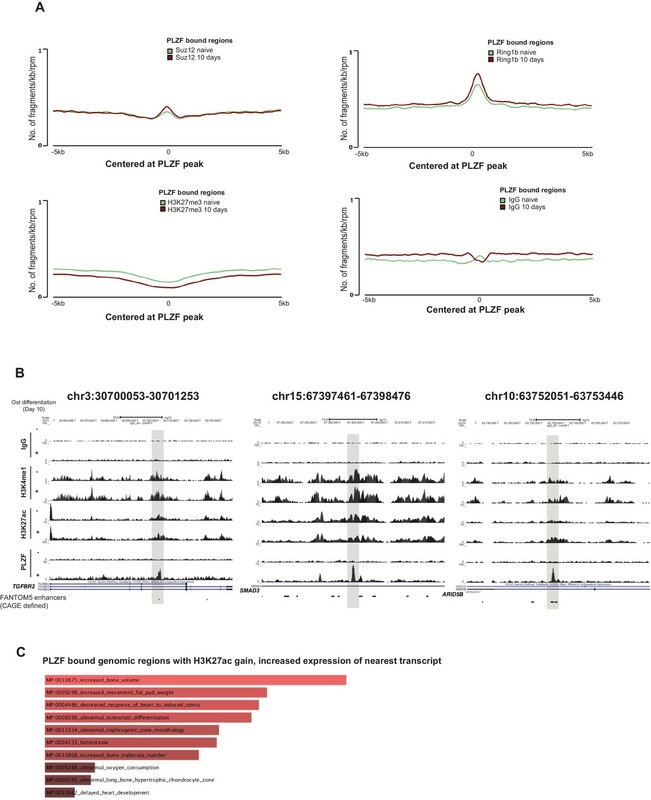 4C-sequencing map revealing that the PLZF knockdown (using siRNA) did not affect the contact frequency between the EnP element and NNMT promoter observed during early osteogenic differentiation (day 2). 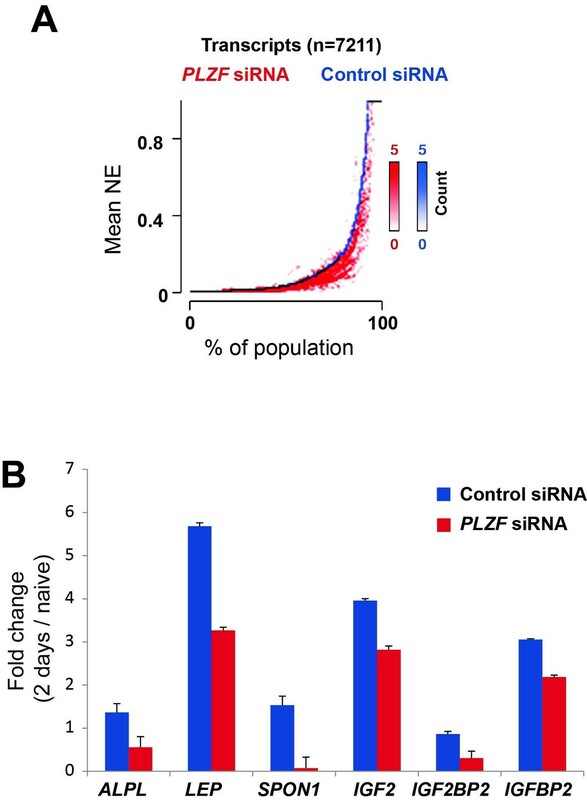 Plots show the overlap between control siRNA and PLZF siRNA in naive (A) or in early osteogenic induced hMSCs (day 2) (B). Sequencing data have been made available via GEO under accession number GSE125168. All other data generated or analysed during this study are included in the manuscript and supporting, source files: Supplementary tables associated with Figure 1, Figure 2 and Figure 3 are uploaded with the submission. 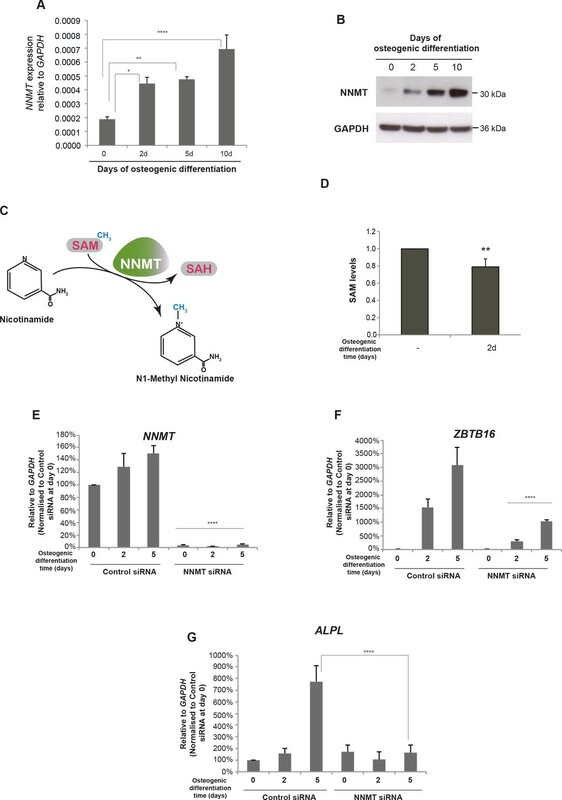 CAGE-derived enhancer candidates were taken from http://slidebase.binf.ku.dk/. 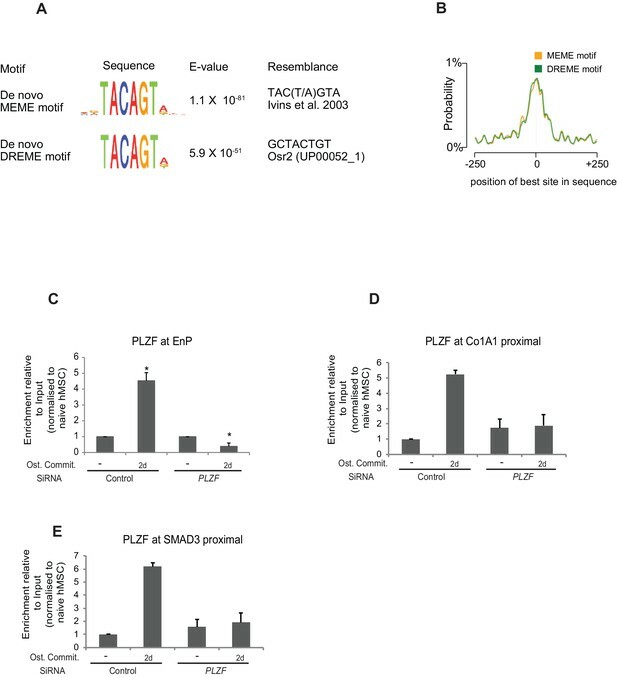 PLZF targets developmental enhancers for activation during osteogenic differentiation of human mesenchymal stem cells. 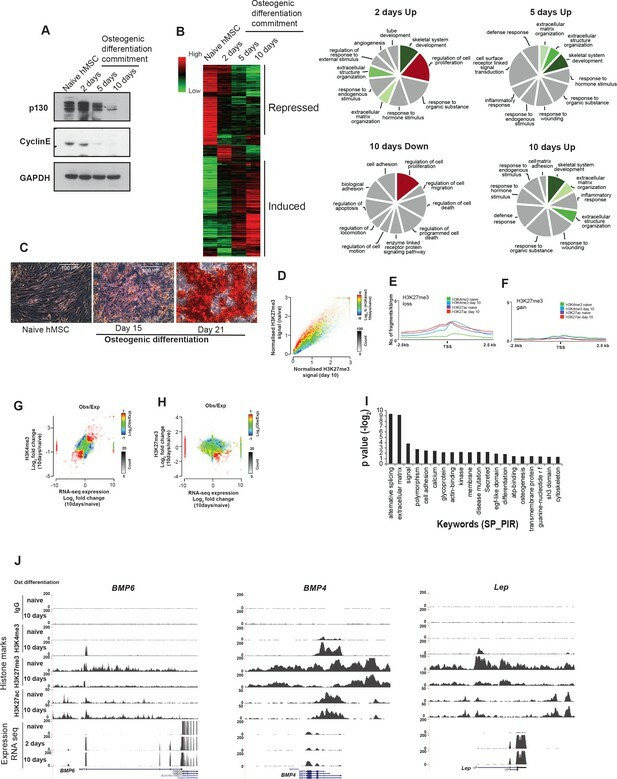 Microarray-Genes-differentially regulated (Osteogenic differentiation induced Vs Naive). 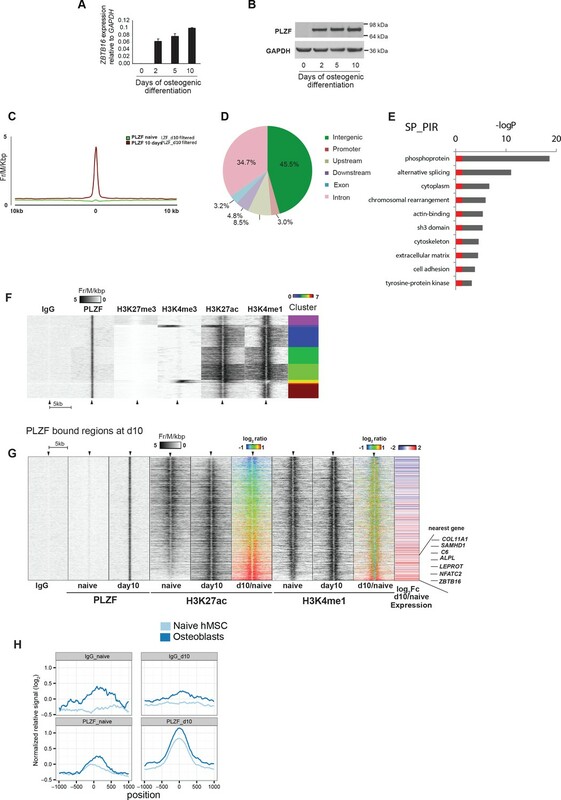 PLZF peaks-Expression of nearest transcript and H3K27ac changes. FANTOM5-enahncers-overlapping to PLZF peak+−1 kb. Differentially expressed transcripts/genes from RNA seq-(PLZF-kd 2 days diff-Vs Control Si 2 days diff, OR 2 days differentiation Vs naive).